The decorative pieces that you'll discover below are all functional as well as ornamental. 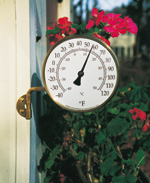 They are crafted to the same high standards as our trellises and arbors. Our Copper Stake is a lovely strong plant support, perfect to hold up your lillies, delphiniums and favorite flowers. Available in three sizes to add a decorative touch to your garden. The 18" can also be used as a hose guard. Light up your summer nights with our Copper Garden Torch. 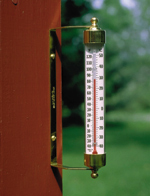 (62" tall) Built of copper for beauty and durability (the wicks include a lifetime warrantee). Each torch comes with an installation mounting rod, and instructions for use with any outdoor lamp oil. They hold enough oil to burn for 6 plus hours. Classic pieces backed by a lifetime guarantee. 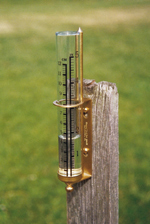 These attractive weather instruments are built using solid brass construction. 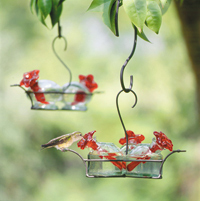 22 1/2 " x 11" x 11"
Handblown Glass Hummingbird Feeders and Stake Beautiful handblown glass Hummingbird feeders add a gorgeous accent to your garden. 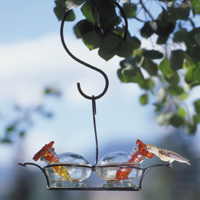 Hummingbirds are attracted to the red feeder-stoppers. All include hanging hooks and instructions. 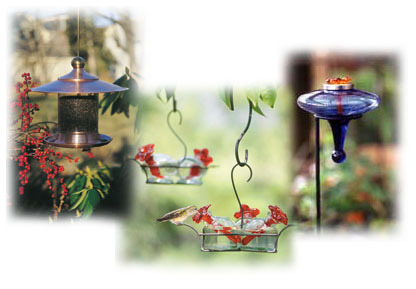 Birds feed from the top of this 15" glass basin style feeder with its own handmade flower feeder tube. Designed to be suspended from a large hanging hook (supplied).